Nissan’s luxury brand, Infiniti is making its mark in the UK for its commitment to pushing the boundaries and going beyond the reaches of other luxury cars. Infinitis are interesting and diverse cars, used Infinitis are increasingly popular because you can pick up a technology and design-focused car, for a great price. The high build quality also attracts many car lovers, meaning its popularity on our roads is going up and up. These models also boast clever design and finishing touches, making it a useful alternative to other high-class car brands. If you’re looking for something executive, there’s the Infiniti M56 and G37 . Both these cars are like your typical saloons, which match up to competitors. 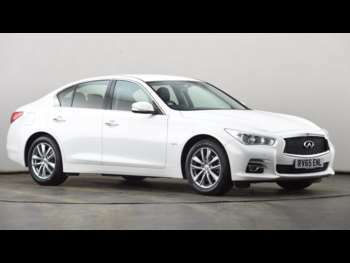 Second-hand Infiniti M56 cars should come at a good price too! The Q70 and Q30 are both sleek and stylish models that attract many car enthusiasts. For something a little larger, you could check out the Infiniti FX. Infiniti cars have been around since the 80s, but they were only introduced to the UK in 2009. Having built a strong reputation for luxury and drive performance, it is predicted we will be seeing a lot more of these in years to come. Their ever-evolving models look stylish and expensive, while the build promises to be long-lasting. Check out the range of second-hand Infinitis on offer at RAC Cars, to see what you can find.